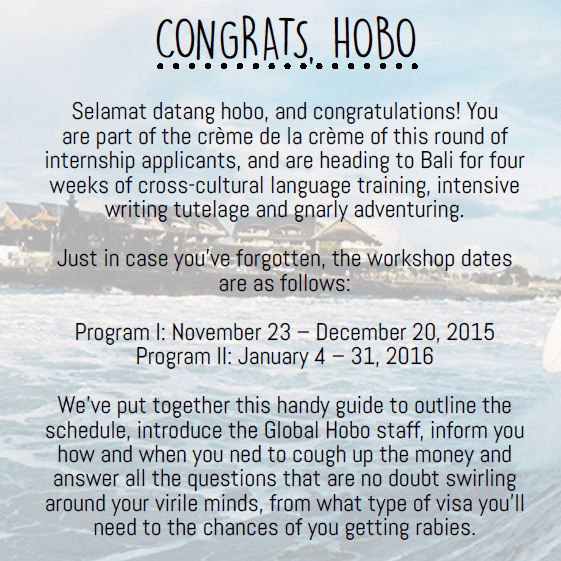 Global Hobo: Travel-Writing Internship in Bali - What Should Baz Do? Back in June an interesting article pop up in my facebook news feed: about a writing internship with Global Hobos in Bali. There was no time to ask the readers to make this decision, and it was 100% clear to me that this was not an opportunity to let pass me by. It was also an extension of the challenge from Chapter One: To make a website where people decide my life for me. I could see that this opportunity would improve my writing skills; blogging knowledge; networking with other travelers/writers; meeting some legendary travelers; and see a place I’ve never seen before. We will be “researching” the area and putting together a travel guide to be published as an eBook. Such a unique experience brimming with potential! *This is a part of my “Australian Intermission” and I will be commencing one of the Top Ten Suggestions ASAP following this Balinese working holiday!